Isn’t it about time the Tories and the Lib Dems stopped their pretence of being separate parties and went for a full-on merger? Perhaps all the left wing parties could do the same – then we would have a simple binary choice at each election. Surely you’re having a laugh at the expense of your less than astute readers? A letter from just one voter is evidence of close political party association??? Huw Sayer – As far as I can see there is only one left wing party, and if you don’t live in Scotland you can’t vote for them. Tom has already said that the links between the Lib Dems and the Tories were now so close, the Tories were urging their members to vote tactically Liberal in order to keep Labour out. Here’s a letter that proves it. 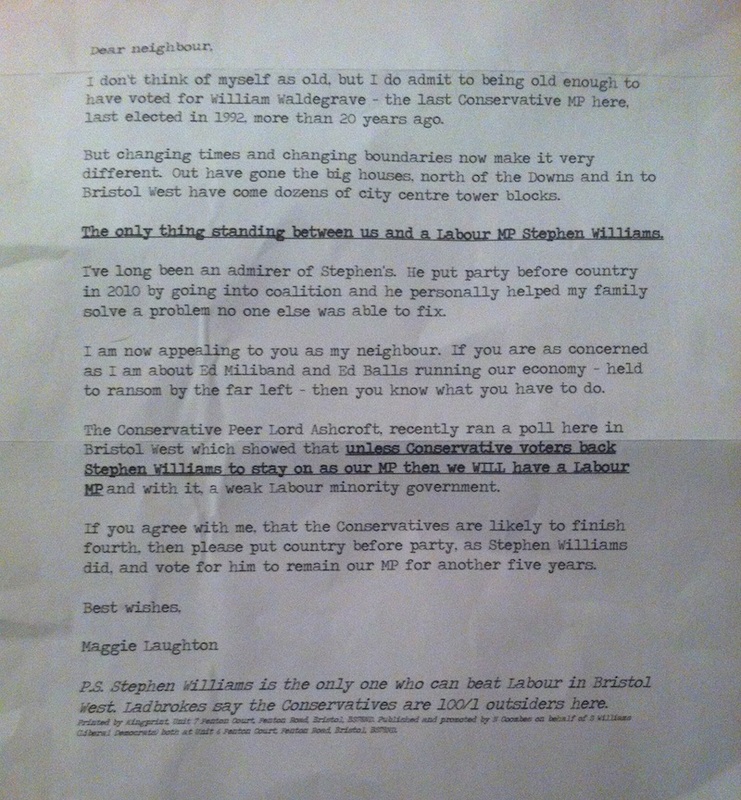 As for the contents of the letter, I’m surprised at the writer commending her Liberal MP for ‘putting party before country’ and going into Coalition. As Overburdeneddonkey points out, the truly honourable thing to do is put one’s country before party, recognising that the needs of the nation as a whole comes before the sectional interest of the political party. The writer has therefore cheerfully admitted that the Tories and Lib Dems don’t have the country’s interest at heart, even though she goes on to raise Tory fears about what Miliband and Balls would do if they got in. The woman writing this clearly has some extreme Right-wing views. She must have, if she’s worried that Miliband and Balls are being held to ransom by the Far Left. Really? Neither can be said to be the darlings of the Far Left. It just shows how hysterical the Tories are, and how far to the Right they’ve moved. The writer herself inadvertently has shown how unfit the Tories are to govern. If the exit poll is right god help us, NHS gone ect.